Siamese-twin pop stars. As of 2019 and the flood of fiction on the market, those words don’t cause anyone to bat an eye; the quest to be unique has pushed any barriers, real or perceived, aside as writers try to capture the last remaining bits of dry ground. But in 1977, undoubtedly it was an eyebrow-raising premise. Aldiss stating that it came to him in a dream, Brothers of the Head (1977) somehow even today can’t help but leave an impression. It’s the 70s, and in an attempt to push the envelope for pop music, producers in the UK get wind of a pair of Siamese twins looking for life beyond their home on a desolate point of headland in Norfolk, and take a chance. Thus are Tom and Barry (and the third, lifeless head attached to Tom’s shoulder) brought to the big city and taught how to play music and sing. The experiment a success, within a year the pair have a band, The Bang Bang, and a couple hit singles. It’s the reality beyond their success, however, that matters. Other than the poor double-entendre of the title, Brothers of the Head is well conceived. Aldiss breaking the story into seven parts, each relays a period of the boys’ lives from a different person’s perspective. The lawyer who goes to Norfolk to sign the papers and bring the boys back to London, the groupie who comes to have an influence on the band, Tom and Barry’s younger sister, their record producer, the psychologist who attempts to treat the pair—through these people’s eyes the reader gets insight into Tom and Barry’s lives. Rather than writing from a “first-person” (two-people?) perspective, the boys lives are contextualized nicely. The approach is likewise somewhat fearful. 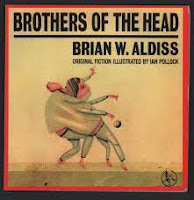 Almost as if Aldiss didn’t trust himself to get inside the heads of conjoined twins, presenting the boys’ story from seven different perspectives is almost never personal or private. Their lives predominantly viewed from the outside, we don’t get to know the twins intimately. Thus if there is any short-coming to the novel, it would have to be that the boys’ personalities are never truly fleshed out—their inner motivations and reasoning put on the page. Living an isolated, lonely life in rural Norfolk one moment and the next a nationwide hit on every television, I can’t help but think Aldiss missed the chance to develop their characters, particularly the reasons behind the perpetual animosity between them that comes to play such a critical role. I understand it is likely impossible for a normal person to attempt to imagine the psychology and mentality of conjoined twins, but then again, isn’t it the writer’s job to attempt it? As for any ultimate meaning to the novella, Aldiss would seem to leave that up to the reader. The idea conceived in a dream, there are a number of possible directions to take interpretation—the significance of individuality, the greed and effect of popular entertainment, human animosity, or something just Weird. Regardless, it is a highly unique tale that leaves its mark if not for premise alone.